Syria’s devastating seven-year conflict began on the basis of strong domestic grievances against the authoritarian Assad rule and local factors have always been key to shaping events on the ground. However, the conflict also quickly assumed an international dimension, with external patronage of local actors simultaneously transforming it into a wider proxy confrontation. At the heart of this external struggle has been a battle between Iran, which has firmly backed the government of Bashar al-Assad, and Saudi Arabia, for a long time the mainstay of opposition support. For both countries the conflict was never principally centred on Syrian grievances but rather a wider struggle for regional hegemony. The regional nature of the Syrian conflict stems from the US-led invasion of Iraq in 2003, which upended Baghdad’s longstanding position as a buffer against Iran’s regional influence. Tehran exploited the invasion to become the dominant power in Iraq, and thereafter strengthened its position in Syria and Lebanon. For Saudi Arabia, this threatened the hitherto ascendant pro-Western regional order. It also posed a perceived security threat given possible linkages between Iran and its own Shi’a minority population, as well as those of neighbouring states such as Bahrain, which Riyadh feared could be incited to rebellion. To this backdrop Riyadh saw the Syrian civil war as an opportunity to reverse the post-2003 regional order, and a means to dislodge Iranian influence in Syria and create a domino effect that could also weaken Tehran’s hold in Lebanon and Iraq (in both of which Iranian influence was far stronger than in Syria in 2011 and which at time represented more important priorities for Riyadh). The Syrian opposition quickly sought to tap into this sentiment, promising a regional realignment away from Iran if Assad was toppled. The Iranian government read these signals very clearly, seeing the conflict as a threat to its regional position and by extension its hold on power at home. But for Iran, the principle threat was never Saudi Arabia, but rather perceived US–Israeli ambitions to use the conflict to weaken its wider position and ultimately pursue a regime change agenda within the Islamic Republic. In this respect the conflict was always seen in more existential terms in Tehran, with the risks facing Hezbollah in Lebanon, which provides Tehran with importance deterrence capability against Israel, seen as particularly acute given the ongoing nuclear crisis and the possibility of military strikes. Despite its ambition, Riyadh was nonetheless slow to materially back the opposition, fearful of encouraging further regional upheaval – following developments in Tunisia, Egypt and Libya ­– that might rebound on the Kingdom’s own domestic stability. Riyadh initially invested in diplomatic efforts aimed at pushing Assad to make political compromises and to withdraw from Iran’s orbit. But by August 2011 in the face of Assad’s intractability and mounting public pressure at home, Riyadh changed tack. Riyadh embraced the regime change agenda and in early 2012 initiated a programme of armed support for the opposition that would eventually be worth billions of dollars. But this Saudi effort was handicapped from the outset as Riyadh found itself engaged in a series of overlapping conflicts. On the one hand, Syria was a theatre to push back against Iran. But it also became the venue for a fierce intra-Sunni regional confrontation. This pitted Saudi support for a more politically docile vehicle of Islam, not just in Syria but also in Egypt and Libya, against Turkish and Qatari support for the more activist wing represented by the Muslim Brotherhood. This rivalry fatally splintered the Syria opposition, leaving it exposed in its fight against Assad but also facilitating the rise of more extremist groups. Jihadist fighters successfully out-flanked so-called ‘moderate groups’ compromised by debilitating divisions, while some external backers turned to more extremist groups as a means of asserting ascendancy over regional rivals. Riyadh was forced to play a delicate balancing act between pleasing actors on the ground and the West’s – and increasingly its own – concerns about the rise of extremists. Riyadh ultimately veered towards close cooperation with CIA-led efforts to strengthen non-extremist rebels, which included limitations on the quantity and quality of arms supplied to the opposition. Indeed, with the rise of the Islamic State (ISIS) and the increasing anti-terrorism focus of Western policy, Riyadh’s attempt to encourage US intervention against Assad – long the Kingdom’s prime ambition – came up short. Set alongside a growing Saudi focus on issues closer to home: the Yemen conflict, intensifying competition with Qatar, as well as the domestic consolidation of power by Mohammed bin Salman, Riyadh grew steadily less committed to the fight in Syria. From 2016, Riyadh increasingly stepping back from the conflict. Iran, in stark contrast, mobilised behind Assad with full commitment of purpose, demonstrating far greater dedication and organisational ability than any of the opposition’s external backers. Iran-backed forces, including commanders from the Quds force, have been present in Syria since 2012. While initial numbers were limited, this support escalated in 2013, and widened to include more substantial backing from Hezbollah, including a critical surge of support in the spring of that year. Since then, Iran has mobilised fighters from across the region, including thousands of Afghanis and Iraqis, and deployed thousands of its own fighters, in what has been characterised as a Shi’a jihad of sorts. 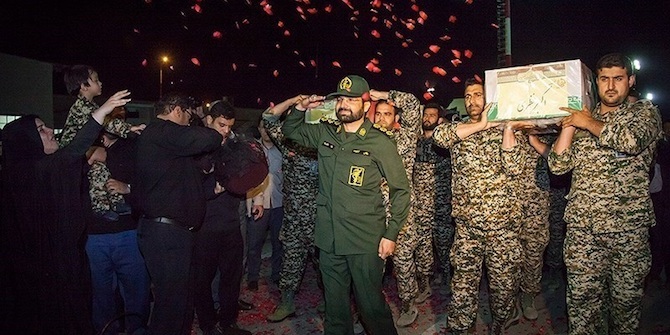 These forces provide critical fighting power, often deployed through the National Defence Forces, where Iran replicated the militia model that it deployed so effectively elsewhere in the region. Here, Tehran’s direct deployment of its own fighters contrasts strongly with the unwillingness of the opposition’s regional actors to deploy their own soldiers. But this has also been a costly exercise for Iran, with more than one thousand Iranians reported to have died fighting in Syria. Critically Iran also helped lock in the full support of a key global power, Russia, which it helped persuade to intervene militarily in 2015. This relationship may not endure, with ongoing tensions highlighting underlying strategic differences. But the two countries have been resolute partners on the ground, combining military efforts to secure Assad’s immediate position. While Iran has periodically broached the possibility of a political track, including a four-point plan initiated by Foreign Minister Zarif in 2013, it has never demonstrated any meaningful commitment towards driving this process forward. If anything, it has played an important role in ensuring that Russia remains focused on military victory, seemingly blocking some Russian efforts to move towards a political solution. Seven years after the Syrian conflict began, the Iranian-backed Assad order has effectively triumphed. Assad rules over a broken state which will remain conflict-ridden for years to come, but the regime has survived. This is a reality that has now been accepted by Riyadh, which has given up on both the military fight as well as political attempts to engineer a near-term transition. Riyadh is now looking to Moscow to limit Iranian influence in Syria, even hinting at the possibility of strengthening Assad at Iran’s expense, which would represent a remarkable reversal. In some respects, the Kingdom’s strategy in Syria may increasingly mirror its approach in Iraq, where it has seemingly adopted a political approach aimed at diluting Iranian influence over the longer term. But Iran will clearly not be easily dislodged, even with Russian pressure. Iran’s presence across Syria is now deeply rooted and includes a widening network of military bases. Here, Tehran’s eye is increasingly focused on the threat posed by Israel rather than Saudi Arabia. It is this conflict which is likely to shape the next phase of the Syrian war. I tend not to read Western comment on Syria. Elijah Magnier Tweeted a link to this article as an example of how Western experts continually read the situation wrongly in the Middle East. So I read your article. Do you remember the old saw, Julien, about how people talk to the person pushing the wheelchair instead of addressing the disabled person? It is the same with you and the inhabitants of Syria. You might as well be writing from another planet as another country. Really, Julien, we’d all be a lot better off if people like you just minded your own business and let the Syrian people deal with what is going on in their own country. They are capable and willing to do just that. My best advice is Get out and Stay out of Syria.